Earlier this week Adam Byrne and I attempted to photograph and record the putative Audubon's Warbler in Lowell, without luck. In the frigid single digit temperatures of the early morning, we merely got fleeting glimpses at the bird in the treetops, and failed to record it. Today (24 Feb) however, we waited until mid-day before we arrived, and we were well-rewarded for it. 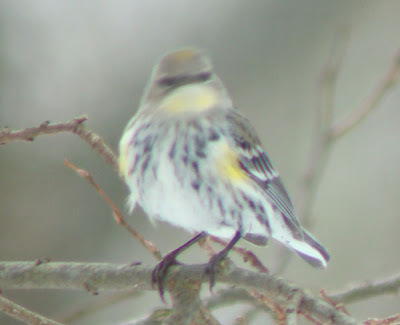 At 2:23PM the bird came into the feeders while Adam, Curtis Dykstra, Bob Tarte, and 3 Lansing area birders watched. The bird was hyperactive and difficult to photograph, but it did allow these much awaited photos: If you look carefully, you can see that at least one mantle feather has a grayish (not brownish) fringe and very thick black center. 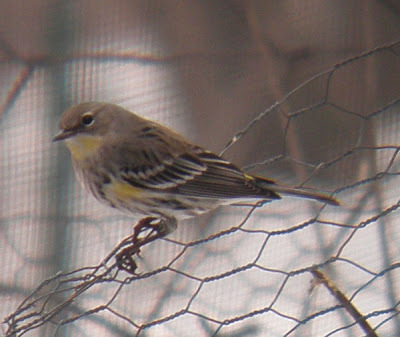 It's probable that this represents a newly-grown alternate feather amongst a backdrop of older feathers (molted last fall). The prealternate molt in this species may occur from Dec-Mar according to Pyle. It may also be that the thicker black motling in the forward and rear flanks represent new feathers as well, but I will defer to anyone who knows this species better than I. Note the flecking on the undertail coverts and yellow on the crown, two features not observed before this day. Copyright Curtis Dykstra 2008. Here you can see the suggestion of an eyeline behind the eye, something which is visible in the field as well. After much effort to record this frustratingly quiet bird, today I finally got one chip note on tape using my Saul Mineroff starting recording package- at the time the bird was distant and there was a lot of background noise, but using Raven Lite software I was able to generate this sound spectrogram of the chip note I recorded (click on photo for larger versions): You can recognize the chip as the inverted "V" shaped mark in the lower left corner, between 4 and 6 kHz. 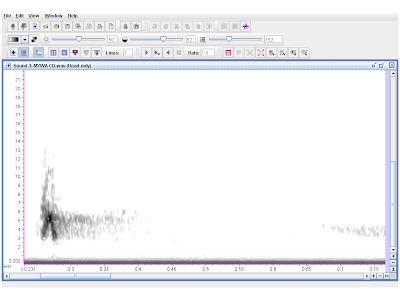 For comparison, here are the sound spectograms of the Stokes eastern Myrtle chip note and Stokes western Audubon's chip note. First, Myrtle: Second, Audubon's: I am not an expert in sound spectrogram analysis, but we can start to look for patterns regardless. First, frequency range: the Myrtle recording from Stokes centers in the 3-6 kHz range, while the Audubon's recording is similar, but seems to show several parallel lines, perhaps harmonics (anyone who understands this better than I, your clarification is solicited! ), which creep into the frequencies higher than 7 kHz. I assume this accounts for the "scratchier" tone of Audubon's chip note. 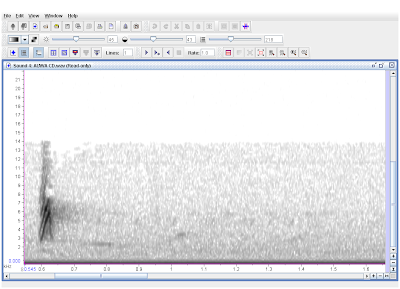 The Lowell bird's sound spectrogram lacks the parallel lines (perhaps due to low recording quality? ), and seems to occur in a narrower range of frequencies. Second, the shape of the "inverted V". That of the Lowell bird seems closer to the Audubon's recording in that the right (descending) half of the V is nearly vertical, while in the Myrtle recording it is more angled. Third, the thickness of the line. The Lowell bird is clearly in closer to the Audubon's recording in this regard- a very thin line, rather than the wider line of Myrtle. Perhaps this is how the qualities our ears and brains utilize to so easily distinguish these species in the field are represented in the spectrogram. 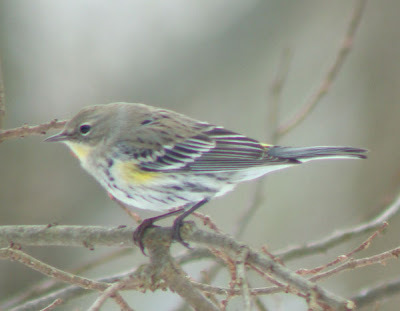 This analysis is certainly preliminary, but as I've indicated before, in the field this bird sounds much more like the Audubon's chip than the Myrtle's chip. 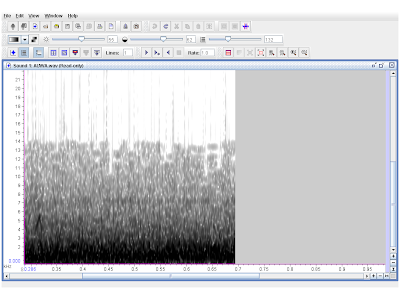 The spectrogram here appears to show many similarities to that of Audubon's, and some key differences with Myrtle. Comments or observations on these musings would be very welcome here. My name is Jeremy Kahn, I am a consultant currently working with the Rwandan government on conservation issues, as well as on developing their birding tourism product. We are currently conduction a survey, and we need AS MANY birders to fill it out as possible, so that we can find out what birders want and how Rwanda can cater to their needs. If possible, it would be so great if we could do a post on your blog, about Rwanda, birding in Rwanda, with a link to the survey. This might all seem a little sketchy to you. If you are familiar with www.fatbirder.com, we have a very good relationship with them, and they have been kind enough to post the survey on their main page. Below is a link to the survey, if you would like to take a look at it (or fill it out!). Thank you in advance for any help you can give us and Rwanda.